SARA, CAN YOU TALK ABOUT YOUR BACKGROUND AND WHY YOU STARTED VITRUVI? WHAT WAS MISSING FROM THE MARKET? My background was in Global Health and I was passionate about medical anthropology and learning about the health and wellness practices of different cultures around the world. I was also fortunate to be able to travel to Kenya and Morocco and learn about wellness practices in each of those places from the locals I was working with. From there, I started Medical to study preventative medicine and it was then that my passion for scent started — I was in my first year and we were learning about the cranial nerves, the 12 nerves responsible for how we see, hear, taste, smell, etc…I became pretty inspired by how scent could influence the brain and questioned why people didn’t use scent more strategically. From there, using my background in Global Health and Sean’s [co-founder] understanding of entrepreneurship and his ability to make anything happen, we came up with the concept for a collection of essential oil products that would help people use the science of scent in their daily routines. Our goal was simple — to create good looking essential oil products that were completely natural and added a little much needed self care to the lives of people during their modern hustle. We designed it in such a way that we would be proud to have it on our living room counter and that it wouldn’t need to stay behind a medicine cabinet. We also priced the products in a way that our friends and Sean and I would be able to afford them. It was really about helping establish rituals by taking botanicals and oils that have been used traditionally for centuries and redesigning them in a modern way. Quickly after we launched our first collection it started to gain traction — that was when we realized that we had unintentionally started to disrupt a very old market, and launched a premium product at a fraction of the price of what traditional companies had been selling essential oils for. CAN YOU TALK ABOUT THE FUNDAMENTAL STEPS OF LAUNCHING A CONSUMER PRODUCT? The only fundamental step is starting. Make a prototype, don’t wait until it’s perfect then test the market, ask people questions, look at everyone else in the market. If you’re not a little embarrassed of your first product then you haven’t launched soon enough. Take time to really think critically about why yours is different and how it will add value to someone. I truly believe consumer products shouldn’t exist unless they are doing something positive for the world or a person’s day. WHAT HAS BEEN THE MOST ENJOYABLE, AND HARDEST, ELEMENTS OF STARTING A BUSINESS? DO YOU HAVE ANY ADVICE TO GIVE TO OTHERS? The most enjoyable has been growing an absolutely outstanding team of people to work alongside everyday. Second to that it has been our customers, hearing the really beautiful stories about how the products are used and how intrinsically they have become part of our community’s daily routine. If you’re going to start a business, and you’re actually really serious about it, then you have to be absolutely obsessed with the industry, product and the people that come with both of those things. If you don’t completely adore the industry, the people, and the community you build around yourself then you won’t be successful. If you’re launching a consumer product, it really needs to be your life. AT THE MOST FUNDAMENTAL, WHAT ARE ESSENTIAL OILS AND HOW CAN THEY BENEFIT PEOPLE? At vitruvi we believe that essential oils are used to elevate simple moments throughout your day. I love using aroma from essential oils to create consistency throughout my days and to really prompt my brain to know when it’s time to sleep, to help to wake up and to make my workspace smell in such a way that helps me get ‘in the zone’. It’s really about taking everyday routines and turning them into wellness rituals by incorporating scent and essential oils. Beyond that, they also have absolutely amazing chemical properties that make them helpful for creating your own skincare, home cleaning products and goods that are friendly for yourself and the planet. WHAT SHOULD CONSUMERS LOOK FOR WHEN CHOOSING AN ESSENTIAL OIL BRAND? I.E. ALL-NATURAL AND NOT ARTIFICIALLY ENHANCED? When choosing an essential oil brand look for 100% pure essential oil products, and that are certified organic when possible. Also, make sure there is transparency in the pricing of their products and the messaging they use to speak to the quality of the oils. Essential oils should be affordable and still make in a premium quality. WHAT ARE SOME OF YOUR FAVORITE OILS AND THEIR SPECIFIC BENEFITS? If I had to pick two I would say Geranium essential oil is one of my top 3 favourite essential oils I love that the aroma is unique and refreshing—with its dynamic combination of floral and pepperminty undertones. It is really balancing to the skin and I like adding it to my moisturizer and using it for face steams. And Eucalyptus essential oil for an energy boost because it helps me remember to breathe deeply, which is especially helpful while travelling. It has great antimicrobial properties as well so I like adding a little under my nose while on a plane or if I’m at home I will diffuse it beside my bed or in my living room when I want my home to feel fresh and comforting. WHAT ARE THE BEST WAYS TO USE ESSENTIAL OILS – TOPICA, INGESTING, THROUGH A DIFFUSER, ETC.? HOW SHOULD YOU STORE ESSENTIAL OILS? Store essential oils in a cool dry place away from direct sunlight. 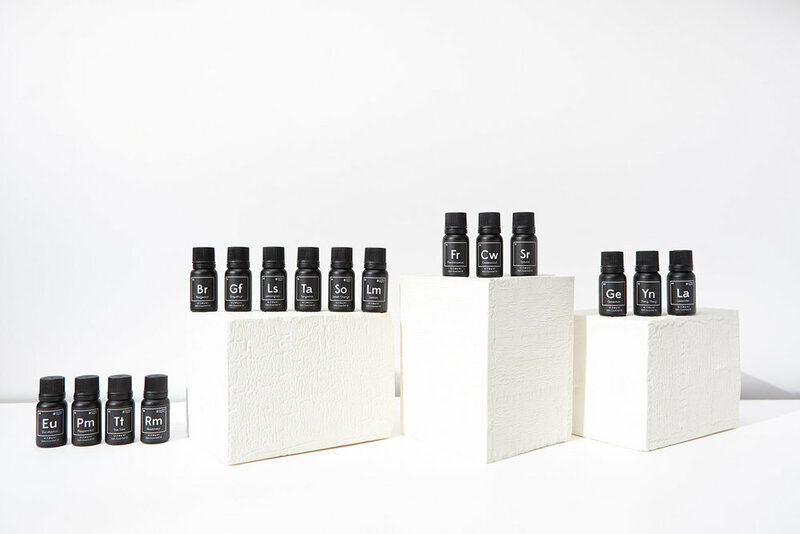 We package all our essential oils in matte black bottles to ensure that no light can affect the oils.